It's been less than a week since the Aakash tablet was released online, and DataWind has already sold out what is touted as the world's cheapest tablet. 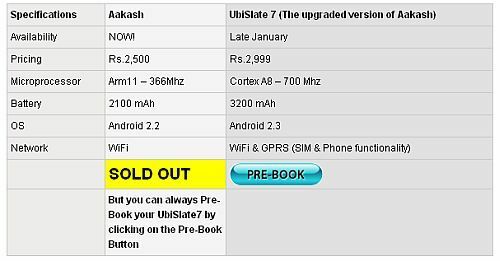 However, the company highlights that its UbiSlate 7, the upgraded version of the Aakash tablet, is still available for pre-booking. It's notable that the UbiSlate 7, priced at Rs. 2,999, is scheduled to be launched in January next year. The overwhelming response to the Aakash tablet was very much expected. The tablet, priced at Rs. 2,500, comes with a monthly data plan of Rs. 98. Read more details about the device in Your guide to the new $35 Aakash Tablet. However, in our previous coverage we had pointed out that the UbiSlate 7 stands out as a better deal as compared to the present Aakash. 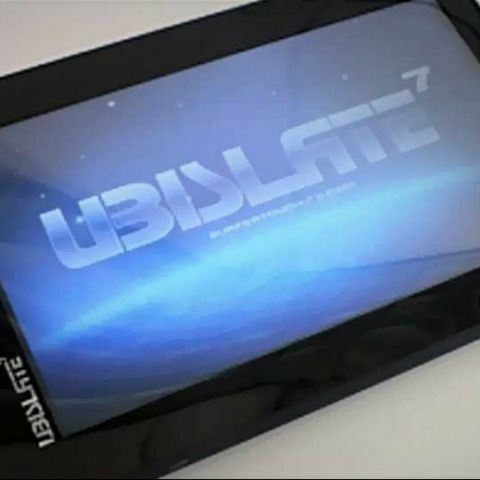 The UbiSlate 7 gives you an upgraded operating system and battery life. Also, you get the Wi-Fi and 3G, with its SIM functionality also extending to voice calls. The UbiSlate 7 costs you just Rs. 499 more than the Aakash. Considering the massive response to the Aakash, we're expecting similar response to the UbiSlate 7 when it is launched next month. Meanwhile, DataWind has not provided any information on when the Aakash will be available again or when the tablet will hit the retail shelves. For more details, visit the official Aakash website. Aakash 2 tablet to launch in October? Visit http://thinkdigit.com/trust to vote for your favorite tech brands in India. Survey participation gives you a chance to win exciting gifts like wireless input devices, earphones and special edition Digit branded T-shirts. As an appreciation of your valuable time and input, every participant will receive an assured gift in the form of Digit discount vouchers. We encourage you to participate in multiple surveys to increase your chances of winning more goodies.